Latvia's capital has its ice hockey team back after a nearly fifteen-year hiatus. Once the top side outside of Moscow back in the days of the USSR, the new Dinamo Riga is set to electrify the city's legions of ice hockey fans. And, of course, visitors are invited to check out the blazing puck action at Arena Riga. Russia, earlier this year, launched a bold challenge to North America's cash-rich ice hockey league, the NHL, by kicking off its own elite league, the Continental Hockey League (KHL). 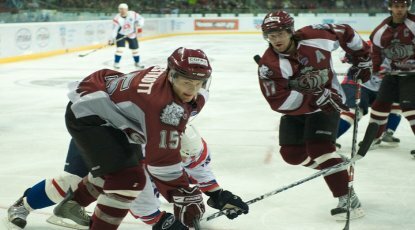 Dinamo Riga is one of three foreign teams – the others are from Belarus and Kazakhstan – to have made its debut in the new 24-team league. With financial backing from a clutch of Latvian business barons and ex-politicians, Dinamo Riga began its 56-game season on September 2, winning 4-2 over Amur Khabarovsk after an exhausting 17-hour journey in the league's first ever match. "It's big excitement – the big hockey is back in Riga," Armands Simsons, the club's director, told The Insider in a telephone interview. At around 8 million euros, Dinamo's annual budget is much smaller than those of some of the other teams in the new league, who have been bankrolled by immensely wealthy Russian business tycoons. But this doesn't bother Simsons. Although he stopped short of slagging some of the other cities in the league, he says his team can attract top players if only because they would prefer to live in a clean, comfortable and modern urban centre. Mark Hartigan, a Canadian forward with Dinamo, sings Riga's praises. "This is a cosmopolitan place. People here are warm and welcoming," he said, adding: "Latvia is nothing like what people think. There is nothing missing here – you have all of the conveniences of any major western city." And how does playing in the KHL match up to the North American game? "The fans are really into it. It gets really loud in the Arena Riga. It's electrifying. This league involves more of a finesse style of play. Where I come from, there's more bump and grind," Hartigan says. Simsons says the signing of another foreign star, Marcel Hossa, was met with a round of hair pulling disbelief from other, far wealthier, KHL teams who had been courting the young Slovakian. "We received phone calls from Russian teams, asking us how come Dinamo managed to sign him (Hossa) and they couldn't." Here again, it seems life and living standards in the city of Riga won the day. "Riga plays a huge role in attracting import players. They choose to play in Riga, to live in Riga, because I think Riga is a most beautiful city with all the facilities. So they are choosing Riga, instead of teams in other Russian cities," Simsons says. But Dinamo is not just about attracting good players from abroad. Its also a source of pride for the country because the team's return means some big names in Latvian ice hockey may not need to leave the country in search of better salaries. Hockey in Latvia came to a grinding halt after the demise of the old Dinamo Riga in 1995. Latvian players sought contracts in Denmark, Norway, Russia and, of course, in the NHL. The new Dinamo, he believes, will be a big morale boost for the country. Currently, 23 players of the 30-player roster are Latvian-born. One of the league's biggest drawbacks, though, are the massive distances that need to be crossed between matches. Some Russian teams are based in cities at Russia's far eastern regions, which can mean travelling through multiple time zones, leaving players exhausted before they've even set a skate on the ice. "This is something our coaches will need to work on preparing players for," Simsons admits. Simsons says the team now has about 700 season-ticket holders and says his organisation is working hard to provide spectators with a complete show, which means pre- and post-match entertainment. Corporate "platinum" season tickets are also available – holders not only get the best seats in the house, but get to hang out with the team and coaches and are invited to VIP events.